Skype does not have the ability to record any conversations between its subscribers. For you to save the calls, you need to have Evaer – one of best Skype recording software for Windows which is an essential app that helps to record your Skype call and keep them for reference. Evaer Skype Recorder is one of Skype software with exciting features. Evaer is the best app to make your Skype calls worth when talking to your friends. It is not the time when Skype was used to connect with different people across the world. In today’s world, you need to make international calls, and if you feel they are important, you can save them for a replay. Well, Evaer Skype Recorder comes with impressive features to color your world. The app is easy to use for all your conferences, podcast, interviews and family VoIP calls. With the app, you can record quality audio and video calls. The most pleasing thing is Evaer recorder captures the original Skype audio and video data without changing the quality. With this app it is possible to store you recorded files in HD format, but that is only possible if your device cameras can record high-quality videos. You need to try this software and experience the difference. 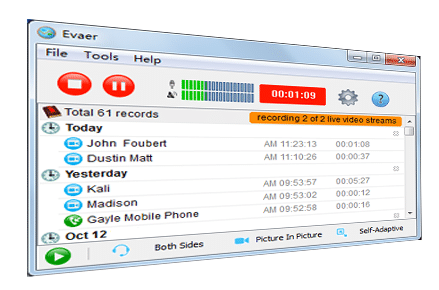 Evaer Skype Recorder is compatible with all Windows devices, and it runs smoothly without delaying. It is a nice application to consider since it offers free download and a free upgrade to give the best service to all users. After you are through with installation, Skype will show a notification that will demand you to restart your Skype to finish the connection. You can now place a Skype call and decide how you want it recorded. You will have the two buttons, both PAUSE RECORDING and STOP RECORDING in case you choose to halt at any given time. When recording video calls, you can choose to select from the options either, Side-by-Side, Remote-webcam-only, Separate files, Picture-In-Picture or Local-webcam-only mode. To playback your recordings, right click on the file and click “PLAY” menu. When you have customized this software this way, all your conversations will be recorded automatically without the need of the PAUSE and PLAY buttons. If at any time you wish to stop, you can do it manually at the record main window despite the tool being set on automatic function. Preview Video while recording Skype calls: It is a nice feature from this application and new to Skype users. 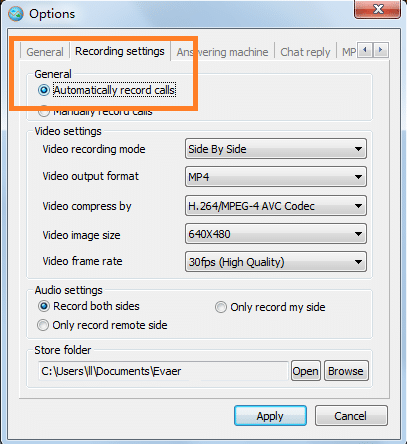 When using Evaer for Skype you can preview your video recordings. It is interesting since you can correct any mistakes and ensure high-quality recordings throughout. Save Skype message and Skype Voicemail: When using this application as a default to your Skype, it will be able to save Skype messages as well as Skype voicemail. This will help you when retrieving your recordings. Automatic chat reply: Evaer Recorder has the capability to reply chat automatically without requesting for permission. The feature is ideal to most commercial users when they are busy with schedules and clients need feedback. This will help them get a quick and convenient reply immediately. Option to record Skype Video calls into MP4 and even AVI files: In this situation, your device camera is the main factor. If your computer has a perfect camera, you will be able to record high-quality video calls and convert them into MP4 format for later reference. Evaer can record face-to-face video files: Depending on your device storage, this tool can record your calls in different modes. It includes Local Webcam Only or remote webcam only side by side recording. You can further choose video output format codes and even sample rate for audio. There is no option to choose between several recording qualities: When recording Skype calls with Evaer Skype Recorder, you will not be able to change the quality of your content. You might be in need of high-quality recordings and end up with low quality. The condition is disappointing and may mess you up when recording for commercial use. I think Skype should come with a feature that has a way to choose as far as recording quality is concerned. With Evaer, there is no notification: When recording, the application does not notify whether you are recording or not. Most of the users will end up without recording because am sure not everyone will remember to turn recording back on after a slight disconnection and as it always happens with Skype. With Evaer for Skype, you can only download five times: This version is valid for 5 times installation, after that the application will not function on your device. Additionally, the software can only record a maximum of 5 minutes conversation. Evaer Skype Recorder is a nice application with good features for high-quality audio and video Skype calls. The app brings new experience to users offering modern features like Automatic chat reply, which is not common in many Skype softwares except few excellent apps like TalkHelper Software. TalkHelper performs better than this application, but they all serve the same purpose. In overall, Evaer Skype Recorder is comfortable software to install on your computer.